I came out of Divergent looking at a nearby bridge thinking I might just be able to scale it. That speaks a little about the levels of adrenalin I reached watching the film. 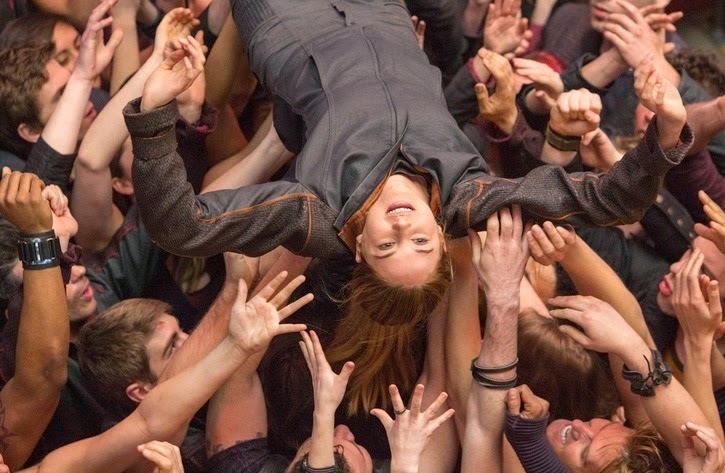 Divergent is a thoroughly enjoyable and thrilling addition to the adventure/sci-fi teen-targeted films, which along with entries like The Hunger Games, the genre is providing quality entertainment for teens and us older folk alike. The film is based on the first in an enormously popular series of books written by first-time author Veronica Roth, in which Divergent is followed by Insurgent and Allegiant. 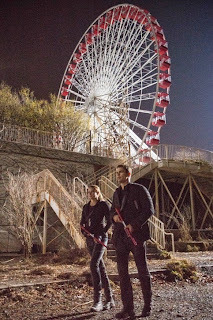 The world of Divergent is a compelling one, which is established quickly in the first few minutes. Set in a slightly ravaged-looking near future Chicago, with barren-looking fields surrounding the edges of the city, a giant fence closing it all in and wildness beyond. Society is split into 5 virtue-based factions designed to build harmony and balance after human nature is felt to have failed and ultimately brought discordance and war. The five factions are Abnegation (The Selfless), Dauntless (The Brave), Candor (The Honest), Erudite (The Intelligent) and Amity (The Peaceful) which you are born into. Once citizens have reached the age of 16, they have the chance to choose which faction they are best suited to, based on the results of a compulsory aptitude test and personal choice. But the cracks in the system are apparent, with those choosing to leave their original faction never able to see their families again, resulting in a group of rejected citizens called Factionless who essentially live as homeless vagrants on the city streets. Trouble is brewing between the Erudite faction, led by clinically cool and superior Jeanine (Kate Winslet) who are jostling with incumbent Abnegation, led by Marcus (Ray Stevenson) for control of the government. Beatrice, or Tris once she joins Dauntless, is a likeable heroine that Woodley plays with a sweet yet determined countenance and has a teen normalness about her which makes her seem more approachable than The Hunger Games’ strong yet stoic Katniss Everdeen. 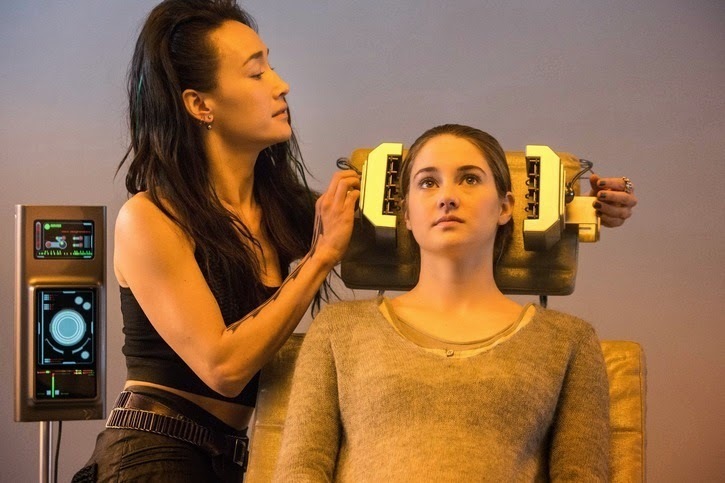 Woodley does a great job at giving us a plucky, yet sensitive heroine and I rooted for Tris, because I knew she had more to lose than the other Dauntless recruits as they took on their brutal and occasionally sadistic “probationary stage” challenges (which could have easily killed them) to avoid becoming Factionless. In Dauntless, Tris meets Four, played by Theo James (Underworld Awakening, The Inbetweeners Movie and Downton Abbey fans know him as “The Turkish diplomat” ahem … enough said). 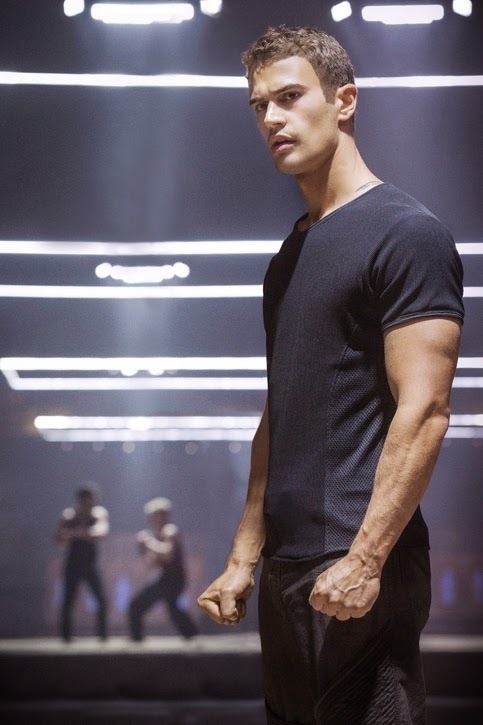 Four is an attractive, tall, dark, brooding, elusive Dauntless initiate instructor with a secret. He is gruff, has an impossibly deep voice, is intrigued by Tris, watchful of her then disappears, then back again, then off again in an Angel from Buffy the Vampire Slayer kinda way. Nice job James … nice job. 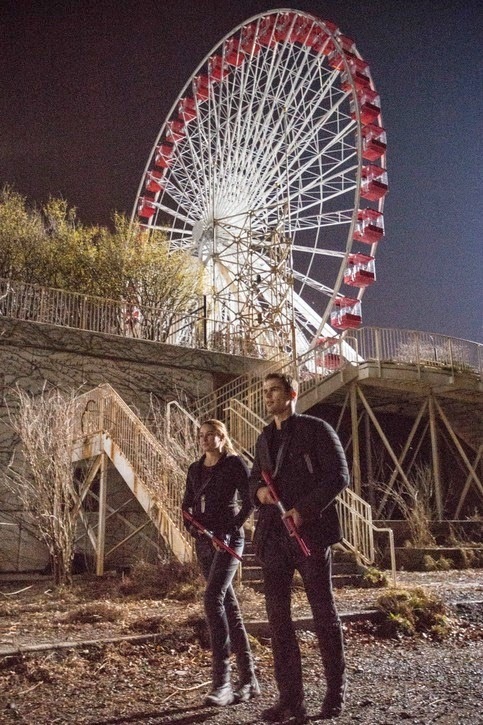 Divergent has some real thrills (and I’m not just talking about Four) it’s shot with intimacy thanks to some point of view moments with the main characters. I have not felt genuine vertigo in a film in a long time, best to warn anyone afraid of heights to brace themselves for some hair raising moments. The Dauntless faction get up to a lot of crazy stuff, I mean they jump on and off moving trains from building tops to just get around the city! I also liked how centralised the action of the film is, being focused on just the city and primarily the Abnegation, Dauntless and Erudite faction bases, so you get a real sense of the geography of the place. I have questions over what feels like a few plot holes but these may be explained and expanded upon in future films. I guess this is something we have to put faith in as part of the territory of films/books in a series. So my questions regarding the trains and exactly what is Divergent, because I hope there is more to it than just being a more complicated human being! These will have to wait or I guess I could just skip ahead and read the books. Seriously how did audiences deal with films that had an original storyline like when The Empire Strikes Back ended and they had to wait 3 years for Return of the Jedi?! How did they do it?! Divergent is not quite as sophisticated as The Hunger Games series in film-making style and swings between naturalism and staginess. When we meet the Dauntless crew and their base, The Pit, it feels slightly choreographed and stagey, almost like better maintained versions of the Mad Max gangs as if they were in West Side Story. Negative comparisons between Divergent and The Hunger Games over their similarities are inevitable but rather pointless. Yes they both feature society controlling dystopias, are based on enormously popular young adult series of sci-fi books, feature strong, positive female leads, involve violence between young people...but aren’t they all really derived from George Orwell’s Nineteen Eighty-Four and William Golding’s Lord of the Flies anyway? So critics might as well get over it and just enjoy. With more teen skewed, sci-fi adventures based on popular books heading our way this year i'll be very happy if they are anything like Divergent, considering it's a highly entertaining ride. Divergent is in cinemas on the 10th April. If you see the film, please share your thoughts below.